Team member widget is most useful to showcase the summary of each of your team member along with a photo and brief introduction. This can be used in Weebly site for different purposes like showing team members of your site, organization or business. 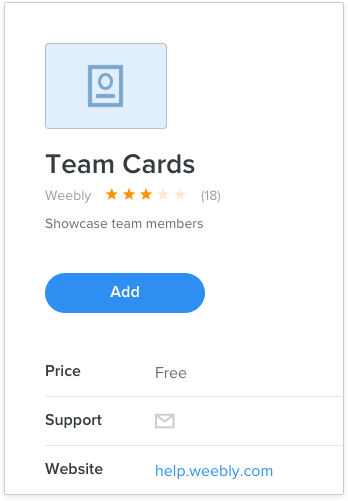 Weebly’s app center has a free “Team Cards” element which can be added in your site easily. Unfortunately the element has lot of bugs which are not corrected till the date of this article and we hope Weebly will correct the bugs soon. You can add multiple team member cards by placing “Embed Code” element next to each other. Colors and fonts of each team member card can be customized as you need. Font awesome social icons are used eliminating the need of social icon images. Twitter, Facebook, Skype, Google+, LinkedIn or any other social icons can be added. This essentially means different set of social icons can be added to different team member based on the profile he / she actually has. Listed below are the steps involved in adding team member widget to your Weebly site. The next step is to add the below CSS code in “main.less” file of your site. If you are adding this CSS in the header section of the site or a page, ensure to add the code within < style >…</ style > tags. Upload the profile pictures of your team members under “Assets” section of Weebly code editor and the uploaded image file path should be like – “http://your-weebly-site.com/files/theme/profile1.png”. The last step is to add the below HTML code inside “Embed Code” element on the page you want to add team members. Adding the above HTML code will enable the one team member card and you can customize the widget by modifying the appropriate section. Replace the image URL with your own from step 3 and use the height and width attributes to adjust the position and visibility of the profile image. The <figcaption> section contains the name, designation and brief description which can be changed as per your need. Use any social icons available with the suitable code. For example, use the code <i class=”fa fa-instagram”> to add Instagram icon. &nbsp; is used to provide gap between social elements which you can delete based on the position on your site. Replace the # with the social links of the team member. Add more team members by placing “Embed Code” elements side by side. Colors and font size can be modified in the CSS code. Each team card width is restricted to 330px for better viewable in mobile devices, you can try modifying this width if you have longer “name + designation”. Images shown are strictly for demo purposes and do not indicate real team members. I tested the first version of this and passed — mainly as it did a poor job of handling long names — should you want a nice clean, even look to the cards (as you see in the sample above). Obviously you need to customize if the name + designation is long. Each team card width is restricted to 330px in the 4th line of CSS code. Increase this width and check it is fitting.